Edward Ralph Dexter CBE, known as Ted Dexter, nicknamed Lord Ted (born 15th May 1935 in Milan, Italy) is a former England International cricketer. A classical, hard hitting stylist and right-arm swing bowler, he captained Sussex and England during the early 1960s. He retains a “critical” eye (often admiring) on the modern game in its many forms. Ted has also been a keen amateur golfer, captaining a winning Cambridge team and boasting some individual open victories along the way. He remains a member of Sunningdale Golf Club (Past Captain) and of the R&A. A “scratch” player for many years he admits to an over technical approach to the game – good for discussion but not so good for scoring. with other sports fans from time to time. You are most welcome to visit “my blog” to check out my views on cricket and golf and even life in general. I will try to avoid the “disgusted – Tunbridge Wells” syndrome. However I ask for a degree of licence due to advancing years and occasional propensity for looking the wrong way down a lengthy telescope. 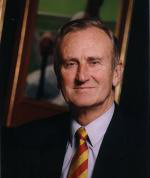 Ted's Technique is a section where Ted Dexter shares his techniques on becoming a successful cricketer and golfer. So you may know where I am coming from, my Biographical data comes in two parts. Short Version and Longer (more official) Version. A jumping off point for resources for both cricket and golf. Links to fixtures and information. BBC Golf feeds - the latest golfing news.